On a tight budget and location is the most important thing? The Golden Tulip Leme might not have a Copacabana postcode, but it’s just a 5 minute walk away from everyone’s favourite neighbourhood and only a block from the beach! It’s the perfect choice for travellers on a tight budget who want to be close to both the city centre and the beaches, and because Golden Tulip is a reliable chain, you know exactly what you’re getting. Upgrade? It’s cheap to upgrade but the standard rooms are just fine, and saving money on your accommodation means you’ve got more to spend while you’re there! Looking for a bargain but want amazing views from the pool? Located in the desirable area of Copacabana, just 2 blocks from the beach, the Royal Rio Palace is one of the best budget hotels in Rio. 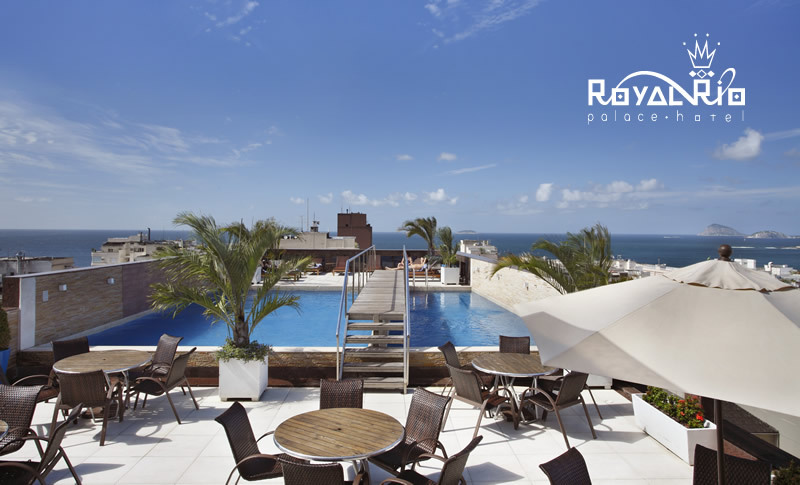 Plus, its rooftop pool and bar offer some of the best panoramic views of Copacabana! Rooms are basic but clean and modern, and the lobby and restaurant feel much more upmarket than the price tag suggests. Upgrade? The standard rooms are at the back of the building and feel quite dark, but it’s very cheap to upgrade your room to one of the brighter, more modern doubles at the front of the hotel. 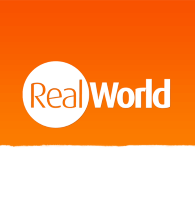 On a budget but won’t compromise on location? 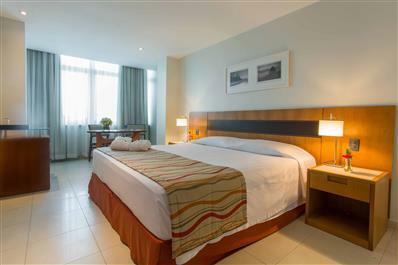 Another Golden Tulip Hotel, this time located right on the promenade in the heart of Copacabana. The rooms are modern and basic, as are the guest areas. There is a sundeck with a bar and a small pool, which offers great views of the sea. 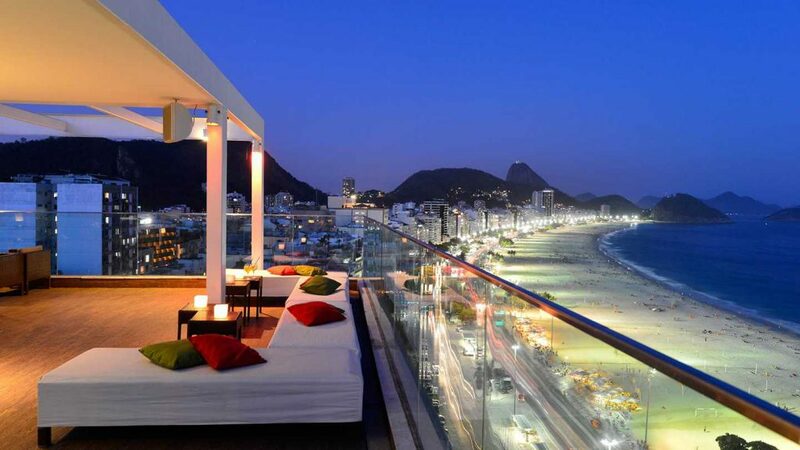 Even the restaurant overlooks Copacabana beach, so if it’s location you want you won’t find better on a budget! Upgrade? There’s no need to upgrade if you’re here for a short stay and plan to spend most of your time exploring. The ocean view rooms are still good value for money though, and offer much more space. On a budget but want a sea view room? 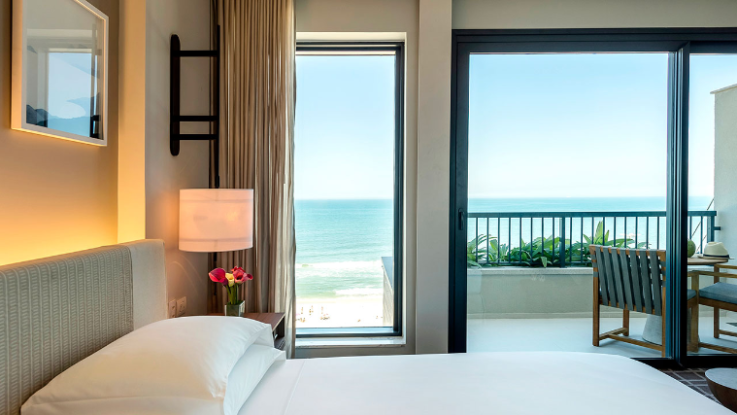 Booking on a budget usually means missing out on a sea view room, but not at the Praia Ipanema, where every room in the hotel has a balcony overlooking the beach! 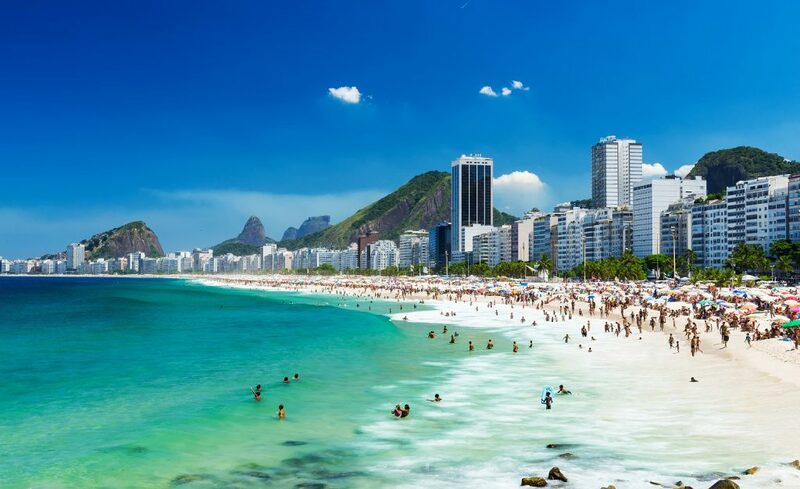 It’s located on the promenade of Ipanema, which is Rio’s laid-back, bohemian neighbourhood. The hotel even has a spot on the beach with sun loungers and umbrellas reserved for customers. Upgrade? The standard rooms are on the lower floors which means it can get noisy, so if your budget will stretch to an upgrade you’ll find yourself on a higher floor with better views, further away from the street noise. Watching the pennies but want the coolest hotel in the best location? 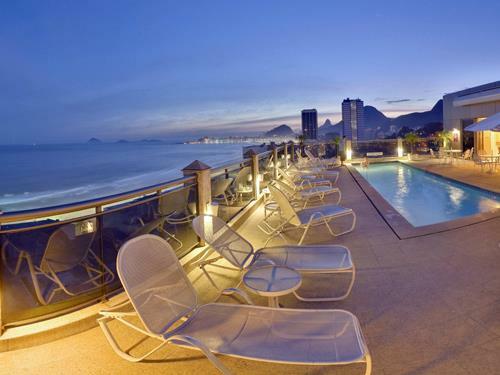 The Pestana is one of Rio’s most famous hotels because so many celebrities have stayed here. 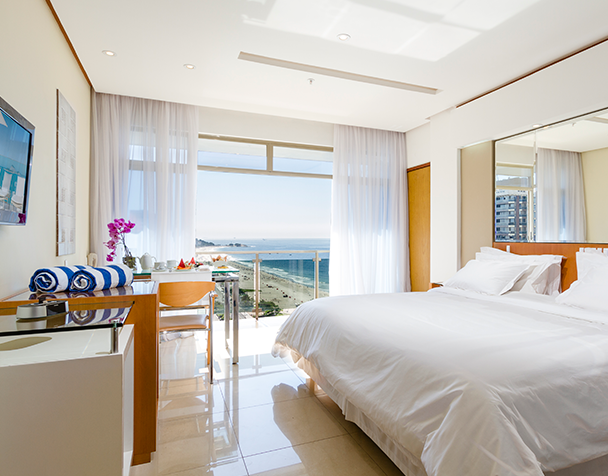 It benefits from the best location right on Copacabana beach, and feels extremely stylish. The rooftop pool has panoramic views, and the poolside bar is known for its lively vibe on an evening. Surprisingly though, the price is extremely reasonable! Upgrade? This is probably the most upmarket hotel you can stay at on a budget in Rio, but only if you opt for a standard room. Upgrades are costly but do offer sea views and very cool décor, especially the suites. Got a little more to spend and want something a bit different? Santa Teresa is Rio’s arty, traditional neighbourhood, with cobbled streets, great restaurants, and tonnes of character. Plus, it’s walking distance to the centre and just a short taxi ride from the beach. 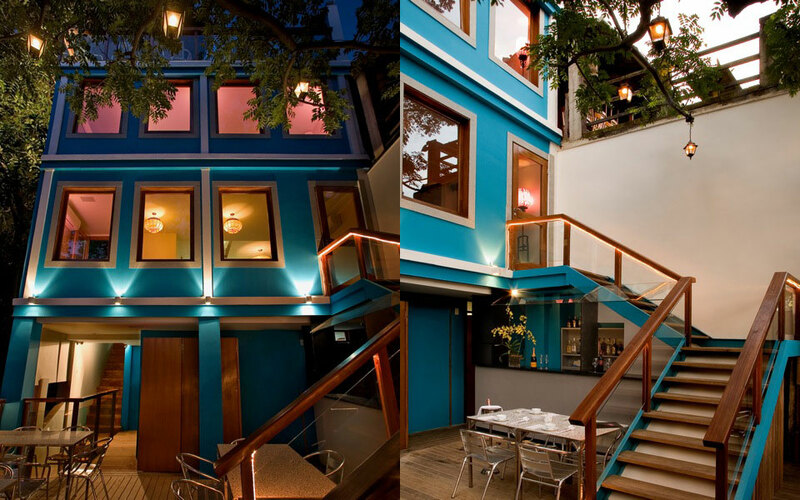 The Quinta Azul is a typically Brazilian hotel, with lush, jungle gardens and beautifully styled, traditional rooms, which is why we think it’s one of the best hotels in Rio! Upgrade? All the rooms here are nice and spacious, but if your budget will stretch to an upgrade we recommend the balcony rooms with outdoor hot tubs. They offer great views of the city and really embrace Rio’s fun, tropical vibe. Got the budget and want a resort feel without compromising on luxury? Barra da Tijuca is a great oceanfront area of Rio away from the city. It boasts some great beaches and restaurants, and is now conveniently connected to the centre by a new metro line. The Grand Hyatt is a large luxury resort hotel, with an impressive pool, 3 restaurants, and a beautiful spa. It’s definitely suited to those who want a getaway rather than a city break. Upgrade? There’s really no need to upgrade here as all the rooms have a five-star feel, and most have views of either the Atlantic Ocean or the Marapendi Lagoon. Slightly bigger budget and great style is important? Windsor is a well-loved hotel chain in Rio, with plenty of budget options, but the Mirarmar is one of the best upmarket hotels in the city. The decor is incredibly beautiful and sophisticated, with high quality materials used throughout, even in the standard rooms. The views from the rooftop infinity pool are, of course, fantastic, and even the restaurant get rave reviews! Upgrade? Sea view upgrades are reasonably priced, but our favourite rooms are the spacious deluxe rooms which feel more like suites. But even if you just go for a standard room you won’t be disappointed. Got the budget and want something both luxurious and traditional? 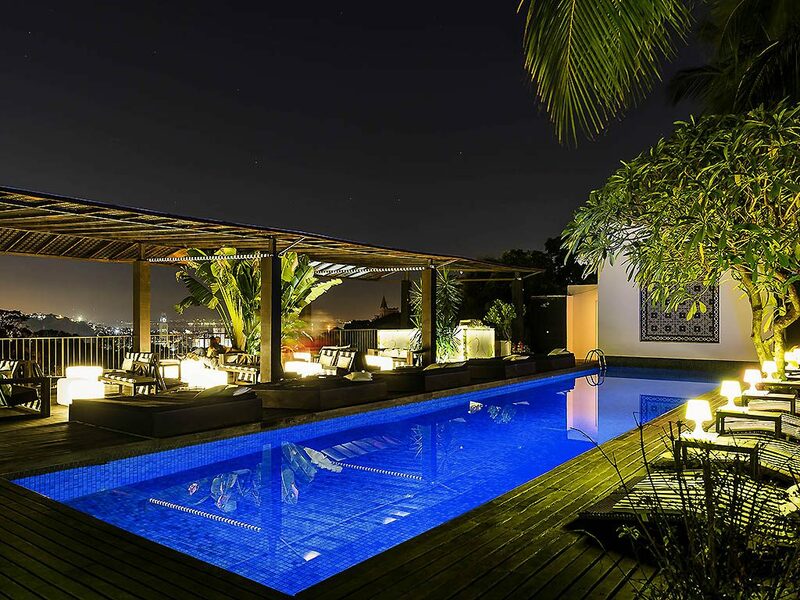 The Santa Teresa is another celebrity favourite, and definitely one of the best hotels in Rio, located on a hill overlooking the city. It offers fabulous design that successfully combines luxury and tradition, with a range of interesting Brazilian artwork. The garden pool is the perfect place to relax, and the bohemian bar is one of the coolest haunts outside the city centre. Upgrade? If you’ve got the budget, why not upgrade to a suite, so you can spend your evenings relaxing in a hammock on your private balcony, with peaceful views of the mountains. The loft suite is one of the most highly sought after rooms in Rio, and a favourite for honeymooners. Ready to splash the cash and want the best of everything?! The most well-known hotel in Rio has to be the Belmond Copacabana Palace. It’s located in a prime spot on Copacabana beach, and is home to one of the best restaurants in the city, the Cipriani, which is famous for its chef’s table. Every aspect of the hotel feels 5-star, and unlike most hotels in Rio, the pool is in a courtyard on the ground floor, so you can walk straight from your breakfast table to your sunbed. Upgrade? 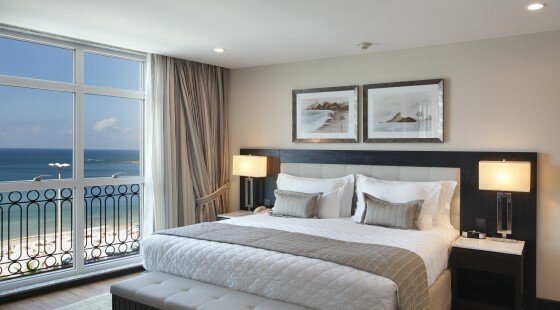 We recommend upgrading to a sea view room, and, if you can afford it, a penthouse suite, as you’ll have access to the private rooftop pool area, reserved for guests staying on the top floor of the hotel.